Kids say the dardest things … and sometimes they are willing to say what adults don’t say because adults are sophisticated and have come to understand politics and the most savvy adults understand that in politics one must accept “what is possible”. For the parents in NSW who were forced to “do nothing” during the time when the NSW schools allow the church to teach “scripture”, this meant attempting to provide an alternative: Ethics. Ethics are a great idea, teaching them on the same terms that the churches are required to teach Religion, is not a good idea, and does nothing to solve the underlying issues with teaching religion in State Schools. The entire “Ethics” program in NSW is an compromise that fails to address the actual reasons why parents are upset. FIRIS parents are bringing a discrimination claim against the DEECD in Victoria, and we have articulated a four point “statement of principles” that we argue should not be suspended so that religious groups can have a chance to instruct “their children” (or your children) in a particular religion. 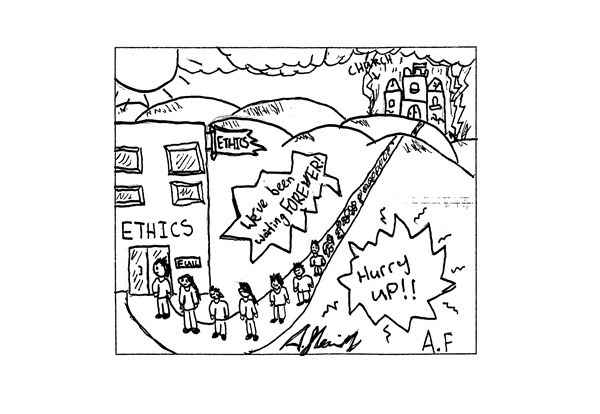 As this cartoon shows, the introduction of an “alternative” merely creates more divisions in our schools. These children are FIVE YEARS OLD, this is not a university where people are pursuing various majors and all working off some schedule that they make up with their advisers. These are primary schools. This is a big sandbox where the primary way ethics are taught should be foundational, not as an alternative to religion. At this point the NSW compromise is firmly entrenched and no one wants to go back and say, “oops, my bad, this won’t work”. What the people who support “Ethics” are trying to do is expedient, it attempts to please everyone, and ultimately it will please no one.